Club Nintendo's Exclusive Premium DS Lites | OhGizmo! By Andrew Liszewski on 09/15/08 • Leave a comment! Since Club Nintendo is still unavailable to those of us living in North America (if you can call a life without Club Nintendo really living that is) I’m once again forced to just sit back and marvel at the cool premiums available to Nintendo fans living in Japan. This time it’s a set of 3 ‘Premium’ DS Lites that feature a metallic plating cover making them rival the iPhone 3G as the king of fingerprint magnets. 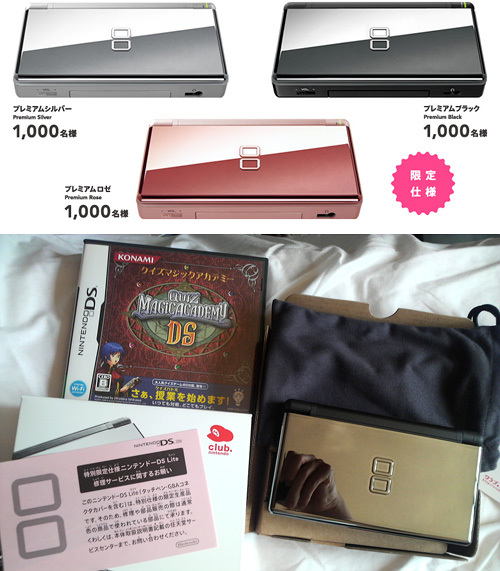 Only 3,000 of the DS’s will be produced, including 1,000 Gloss Silver, 1,000 Jet Black and 1,000 Metallic Rose, and due to the limited availability, Club Nintendo members will have to enter a sweepstakes requiring them to submit the serial numbers of 2 purchased DS games in order to qualify.